I came across some sites on Twitter today there weren’t auto-linked, and I was kinda looking for a reason to write another Ubiquity command, so I made URL Tool. It adds 2 commands and a noun for dealing with non-linked URLs. 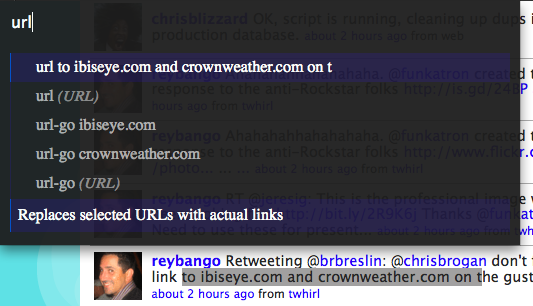 One command, called “url”, will look in your selected text for any URLs and make them into links. The other command, called “url-go”, will look in your selected text for any URLs and let you choose one to open in a new tab. You can install the commands here. Now to actually look at the sites I made this for.